Mandeville, LA – One of the driving forces of the Brotherhood’s yearly work for The Hogs For The Cause is Brother’s love of performing acts of Christian charity but there is an added benefit to this volunteerism for Catholics: Hogs happens during Lent and according to the 1966 USCCB Pastoral Statement On Penance And Abstinence, performing acts of charity for charitable entities is actually called for as an acknowledged Lenten penance! 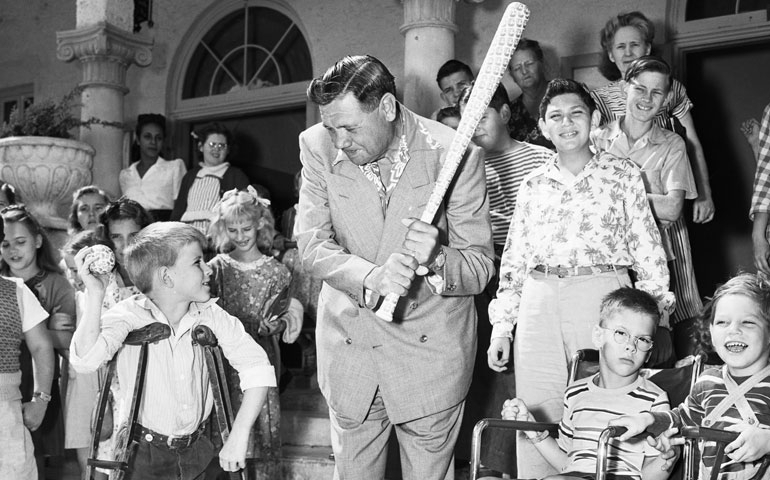 So, your donations to Hogs For The Cause this Lent actually are part of a reverent Lenten sacrifice and penance AND you’ll be following in the footsteps of baseball’s greatest player, Babe Ruth. Surprised? There is a side of Babe Ruth that the secular world doesn’t speak of because it isn’t convenient to the “fat drunk and stupid” narrative of a hedonist gone wild on baseball riches. The real Babe Ruth, while challenged by gluttony, was a very charitable man and would have made a great member of the Barbacoa Brotherhood! This entry was posted in News and tagged hogs, lent. Bookmark the permalink. ← BBQ Chefs: Put The Foil Down And Slowly Back Away!